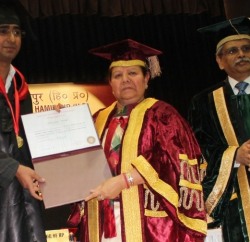 In the 25th meeting of University Court, Governor Urmila Singh, who is also the Chancellor of H.P. University stressed upon the need for conducting studies in archeological science in order to have a better knowledge of rich traditional heritage of the State and for preserving it for future generations. 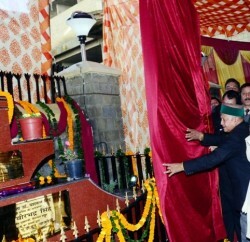 Governor said that the State had its unique cultural identity and its artifacts, monuments and museums were historic and famous across the country. She said that every district of the state had its own rich traditions including the tribal areas whose exotic culture and lifestyle attracted people across the globe. She said that cultural diversity of the State needed to be protected and archeological studies should be conducted to have a better understanding besides preserving these ancient crafts and traditions for posterity. Urmila Singh said that the State had tremendous tourism potential and attracted lakhs of tourists every year. She said that in order to exploit the immense potential the industry offered, effective strategies and plans should be prepared besides drafting curriculum and study materials based on latest information in this field. Stressing upon the role of women in society, Governor said that empowering women would strengthen not only the society but country as well and their contribution in the fields of education, health, agriculture, human resources, science and environment sectors could be very effective. New Schemes for their upliftment should be prepared and implemented so that their economic empowerment was ensured, she said. The Chancellor underlined the importance of integrating moral values along with academic studies so that youth could become responsible citizens of the country. She said that objective of educating students should be ensuring personality development which included equipping them with good values and sound knowledge of their subjects leading to their empowerment in every sense. Education lacks its meaning if tolerance and human values were not inculcated in youth, she added. 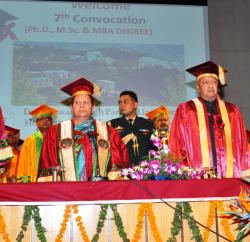 Earlier Himachal Pradesh University Vice-Chancellor, Prof. A.D.N.Bajpai welcomed the Chancellor and detailed about the activities of the University. He said that various initiatives have been taken to impart qualitative education to students and added that efforts would be made to start 57 new courses, 10 new departments, 11 research centres and to set up seven new Chairs identified under vision 2020 in a phased manner in near future. I.D.Lakhanpal, Chief Parliamentary Secretary was unanimously elected as the Member of Executive Council. The court also approved the Annual Account Report of the University for the Year 2008-2009 and 2009-10 besides Annual Report for the year 2011-12. Members of University Court also apprised the Chancellor about the problems of the university and gave their valuable inputs. I.D.Lakhanpal, Chief Parliamentary Secretary, Bambar Thakur MLA, Members of Executive Council and University Court, Dr. Shrikant Baldi, Principal Secretary Finance, Anita Tegta, Secretary to Governor, senior officers of the State Government and University also attended the meeting.